This was the other pie I made for the National Pie Day pie contest at Pacific Pie Company. Personally, I preferred this one, but when the people spoke, the people said, “Butternut Bliss.” That’s fine. More Moroccan Spice Butternut Pie for me. Place flour and butter in a food processor and pulse until you have a coarse crumb texture. Add the water one tablespoon at a time until large clumps start to form. Dump out the mixture on the counter, form into two balls, cover with plastic wrap and refrigerate for at least 30 minutes. Peel and seed the squash. Cut into approximately 1-inch cubes. Toss with olive oil and salt. Spread on a single layer on a cooking sheet. Roast for about 20 minutes or until tender and slightly brown. Place in a large mixing bowl. While the squash is cooking, heat the remaining 2 tablespoons of olive oil in a large skillet over medium high heat. Add the onions, and saute until wilted, about 4-5 minutes. Reduce heat to low. Add 2 tablespoons water and a pinch of salt. Continue cooking for about 30 minutes, or until the onions are brown and sweet. Stir occasionally. When the onions are brown, increase the heat to medium high and add the garlic and ginger. Saute for about 1 minute then add this mixture to the squash in the bowl. Also add the cumin, cinnamon, cilantro, raisins, almonds, salt and pepper, and cornmeal. Toss well to combine. Whisk the egg with a tablespoon of water in a small bowl. Roll out both balls of pastry dough. Spread one over the bottom of a 9 inch pie pan. Fill it with the squash mixture. Brush the edge of the pastry with the egg wash. For the top pastry crust, cut a couple of vent holes, then place it on top of the pie. Seal and crimp the edges of the crust. Brush the top of the pie with the egg wash. Allow pie to cool at least 10 minutes before dusting the top of it with powdered sugar. Did you know that National Pie Day is January 23rd? I know what you’re thinking: January 23rd? 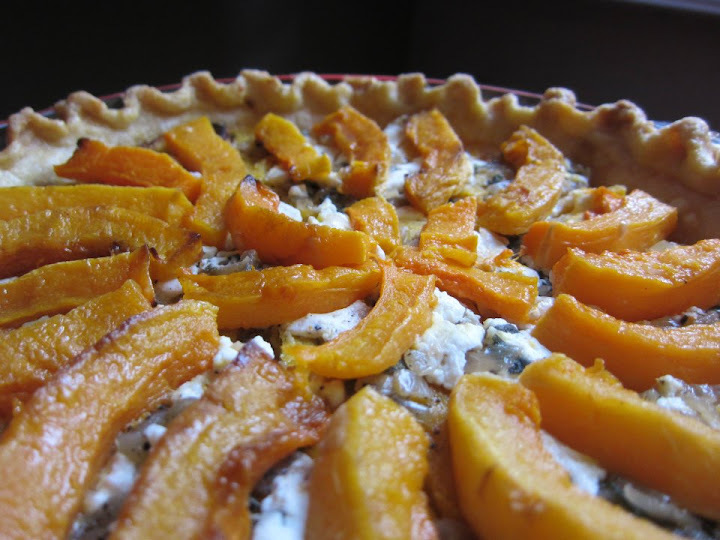 Why not summer, traditional pie season? or why not March 14th, the nerd’s Pi(e) Day? Or how about around Thanksgiving when tables are loaded with pies? Well, I had these thoughts, too, but then realized what’s so great about having National Pie Day in the middle of January is that you’ll get to eat lots of pie in the pie off-season. You may not even realize how much you’ve missed pies, but once you get baking, you’ll wonder why you waited so long to make a pie. It’s pie when you least expect it — which, of course, is the best kind of pie. 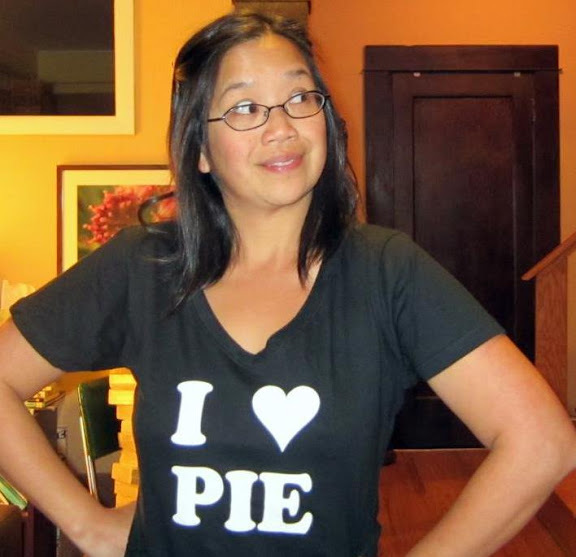 The fabulous Portland pie shop, Pacific Pie Company decided to throw a pie bash this year in celebration of the day. And what better way to do that than with a good old-fashioned pie contest? Did someone say “pie” and “contest” in the same sentence? Yeah, so I was excited. I had several ideas for pies — I figured I’d stick with the savory category since that’s my strong point (plus savories tend to be under-represented). I wanted to make it season appropriate so I stuck with winter flavors. I tried out several test pies and ultimately it came down to two: A simple roasted butternut squash one or a more complex Moroccan spice butternut squash pie. I couldn’t decide between the two… so I made both! There was formidable competition. Even in the smaller savory category, there were at least a dozen pies. The judges clearly had their work cut out for them… if they could manage to taste them all without keeling over. In the end, my roasted butternut squash pie — which I called Butternut Bliss Pie — came in second, but sadly, the one I actually liked more, the Moroccan Spice Pie, was not awarded a prize. No matter, people were way into the Butternut Bliss and second place nabbed me some pretty cool pie booty. Can’t complain about that. Place flour and butter in a food processor. Pulse a few times until you have coarse crumbs. Add water 1 tablespoon at a time until large clumps start to form. Dump out the crumbs onto the counter, form into a ball, cover with plastic wrap and refrigerate at least thirty minutes. Peel the squash and separate the bulb from the long neck. Cut the neck into manageable lengths (about 3 inches long) and then slice the pieces lengthwise, about 1/4-1/2 inch thick. You should wind up with about 8-12 slices that are something like 2 inches by 3 inches square. For the bulb, split it in half and remove the seeds. Slice the bulb in long strips about ½ inch thick. Toss all the pieces in olive oil and spread in a single layer on a baking sheet. Roast for about 20 minutes until the pieces are slightly brown and soft. Set aside and allow to cool slightly. In a small saute pan over medium heat, melt the butter and add the shallots. Saute for 2 minutes, then add a tablespoon of water and a pinch of salt. Reduce heat to low. Stir occasionally and continue to braise for 20 minutes. Add the sage, saute for about a minute more and then remove from heat. Roll out the pastry dough and place it in a 9-inch pie pan. Lay down a single layer of the square squash pieces, trimming them if necessary to make a flat layer that completely covers the bottom. Add a layer of the shallot mixture, then a layer of the crumbled goat cheese. Sprinkle a bit of black pepper over the top. Repeat with another layer of square squash pieces, shallots and goat cheese. 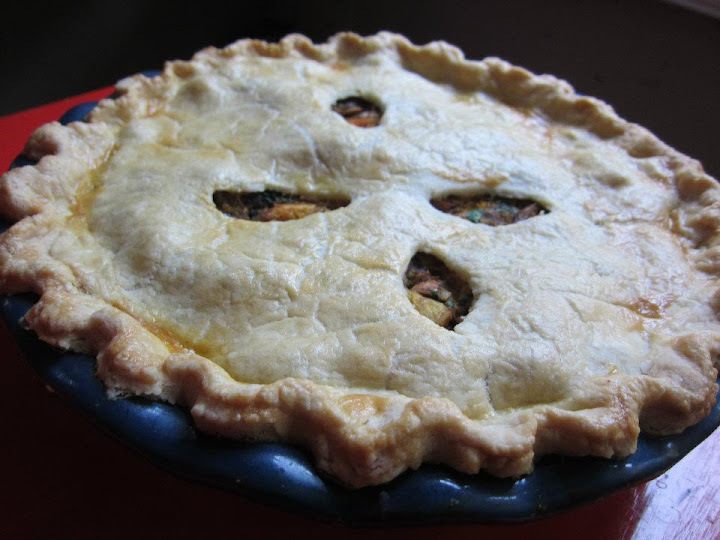 Top off the pie with the rounded bulb pieces which you can fan out symmetrically over the top. Bake for 30-40 minutes or until the crust is brown and the cheese is melted.